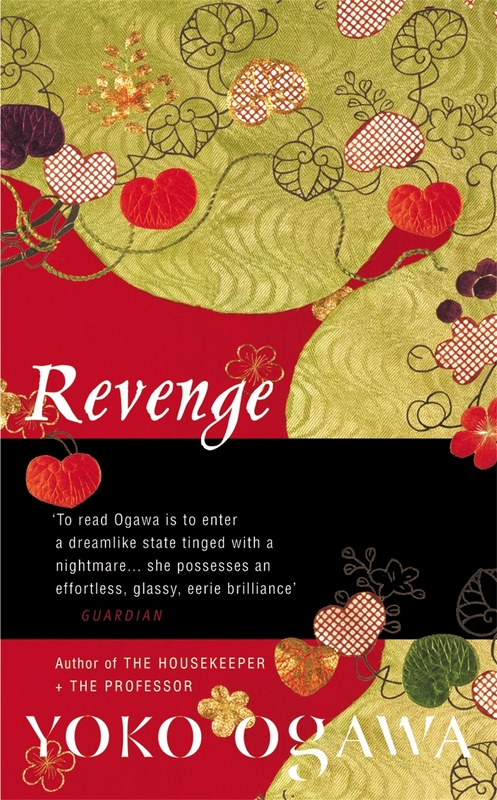 Revenge, by Yoko Ogawa, translated from Japanese by Stephen Snyder, is a mesmerising, weird, and elusive meditation on...what, precisely? Coming up with possible answers to that question is one of the many engrossing challenges of reading Revenge, a collection of eleven short stories, each bound to others by cobwebby chains of connection, and each giving glimpses of the world seen through a most dark-adapted eye. What few of the stories seem to be about, or at least not obviously, is revenge. Granted, some seem to concern marital, or romantic, revenge: in Old Mrs. J a woman apparently kills in revenge for being trapped in a disappointing marriage; in Lab Coats another woman kills because her married lover prevaricates about ditching his wife; in Sewing for the Heart a bag maker kills because, as he sees it, a customer rejects the bag he has crafted for her, to hold her heart, which lies outside her chest, and hence she also rejects him. But some of the stories seem to have little or nothing to do with revenge. Afternoon at the Bakery, the horrifying first story in which a mother fails to assimilate the unassimilable fact that her child has died in an abandoned refrigerator, seems to be about the way lives can be smashed by improbable, but devastating events; the final story, Poison Plants, which wheels back to Afternoon at the Bakery through the "motif", if that is what it is, of a dead child in an abandoned refrigerator being found by an old woman, seems to be about the loss and degradation of ageing, and the pity of mortality. Indeed, the whole book drips with the menace of mortality; in every story there's a death, or deaths, although not every story has a death as its central event. Still, Poison Plants and hence Revenge, closes on, and thereby emphasises, the idea of mortality, with this account from the narrator, an old woman, of finding the aforementioned dead child in a refrigerator: I opened the doors - and I found someone inside. Legs neatly folded, head buried between the knees, curled ingeniously to fit between the shelves and the egg box. "Excuse me," I said, but my voice seemed to disappear into the dark. It was my body. In this gloomy, cramped box, I had eaten poison plants and died, hidden away from prying eyes. Crouching down at the door, I wept. For my dead self. It's not obvious, to me, how to interpret this passage, but whatever it means, and whatever its relation to Afternoon at the Bakery, it gives the flavour of Ogawa's style - at least as it reads through the veil of translation. Peering through that veil, it does seem that Ogawa writes of horror, cruelty, desperation, lives gone awry, in short, exact, even forensic sentences, generally unadorned. The effect is often hypnotically, but precisely, threatening. This, from Welcome to the Museum of Torture, is Ogawa on a dead hamster lying between a crumpled hamburger wrapper and a crushed paper cup in a garbage can at a fast-food place: Its fur was speckled brown, and its tiny arms and legs were a beautiful shade of pale pink. The poor thing almost still looked alive. I even imagined I saw its little paws twitching. Its black eyes seemed to be looking at me. I opened the lid the rest of the way, releasing the smell of ketchup and pickles and coffee all mixed together. I was right, the hamster was moving: hundreds of maggots were worming into its soft belly. All in all, Revenge is a mysteriously wonderful book, as beautiful as the mould of decomposition soon to be spreading across that hamster. I urge you to read it - and then at once to re-read it, to retrace the many delicate threads that link Ogawa's stories and to re-evaluate what you think she might be saying. The US edition is published by Picador, and it might be available in parts of Asia, but I read the UK edition published by Harvill Secker, http://www.vintage-books.co.uk.